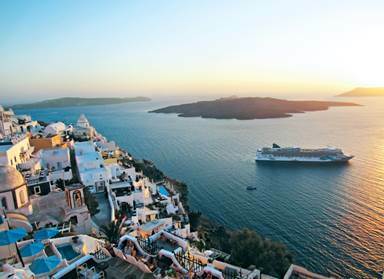 Norwegian Cruise Line is encouraging its guests to go out and explore the world and their dream destinations with a new Free at Sea promotion that now includes an option to select free shore excursion credits in unlimited ports of call. From now through January 16, guests can choose from up to five free offers† when they book a new cruise vacation, to experience the trip of a lifetime with the most freedom and flexibility available at sea. With Norwegian’s Free at Sea, guests who book a new three-day or longer sailing in an oceanview, balcony or minisuite category stateroom† can select their preference of two free choices from five incredible onboard amenity offers*, including free unlimited open bar, free Specialty Dining package, $50 towards shore excursions in each port per stateroom, a free 250 minute WiFi package, or Norwegian’s Kids Sail Free offer that allows third and fourth guests, whether they are kids or kids at heart, to sail for free on almost 400 cruise departures dates. Inside staterooms, as well as Norwegian’s Studio staterooms for solo travelers, can choose one free offer. Guests who book a sailing in a suite or The Haven by Norwegian® will enjoy all five free amenities, providing up to $2,800 in added value to their cruise. Those looking to soak up the warm sun of the South Pacific while gazing upon the lush island seascapes of the Hawaiian Islands can do so on a on a one-of-a-kind cruise vacation aboard the recently renovated Pride of America, the only ship to sail roundtrip from Honolulu year-round and who also has her own exclusive Free at Sea offer^. Guests who book a new seven-day inter-island Hawaii cruise now through January 16 aboard Pride of America in any stateroom^ category will have the freedom to select one of five offers to enhance their cruising experience including a free one-night pre-cruise hotel stay*** with an option to select reduced airfare starting at $399 from select gateways, a free Specialty Dining Package**, free pre-paid service charges for the first and second guest in the stateroom, free $50 per port shore excursion credit per stateroom, or Norwegian’s Kids Sail Free, where the third and fourth guests in each stateroom sail for free on select dates. Guests who book a suite aboard Pride of America will receive all five offers†. Norwegian will transport guests on an immersive cultural quest during the summer of 2017 with five ships sailing in Europe. Norwegian Getaway will cruise the Baltic Capitals from Copenhagen and Berlin (Warnemunde). Norwegian Jade will sail the Norwegian Fjords from Hamburg, Germany and London (Southampton). Norwegian Epic will return to her seasonal homeports of Barcelona and Rome (Civitavecchia) to sail the spectacular Western Mediterranean on seven-day cruises that offer calls in Pisa, Cannes and Palma, Majorca. Norwegian Star will cruise the crystal blue waters of the Greek Islands and Norwegian Spirit will sail 10-day and 11-day Mediterranean sailings from Rome (Civitavecchia). *Guests are responsible for an 18% gratuity for retail value for Specialty Dining Package, Unlimited Beverage Package, and/ or the Soda Package, with pricing based on number of cruise nights. Suites or Haven guests will not be responsible for the 18% gratuities related to the Specialty Dining Package, Unlimited Beverage Package, and/or the Soda Package. Number of meals for specialty dining package based on length of itinerary. $50 USD per port shore excursion credit is per stateroom and is applicable for each port; it is not transferable to other ports. Overnight stays count as one port, except Bermuda sailings which can receive up to 3 individual days of shore excursion credit. Wifi package offers one login per stateroom. On Norwegian Breakaway, stateroom receives an internet package of 250 minutes or 1000 MB of data. *** Cruises must be booked more than 30 days prior sailing, when selecting hotel option; if choosing hotel option with air option cruises must be made more than 60 days prior to sailing. Offer valid for Waikiki Marriott Resort-city view room. In the event that the hotel scheduled to be used in package is unavailable, for any reason, Norwegian Cruise Line reserves the right to substitute the hotel included in package. One night pre-hotel offer is available on reservations with 4 guests or less. If choosing 1 night pre hotel option, reservation must be made more than 30 days prior to sailing. ^*Offer is not applicable to categories IX, OX, BX, MX.